Color in the picture of a vampire using a vacuum and then write letter V v on the primary-ruled lines. 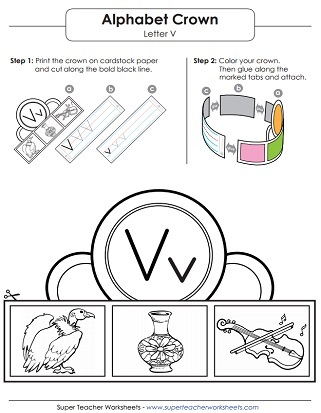 Write some Vs on the lines and color the pictures. Cut out the hat and put it together to wear. Practice writing lower-case v by tracing on the dotted lines. Learn how to write lower-case v by following along the gray lines with a pencil. 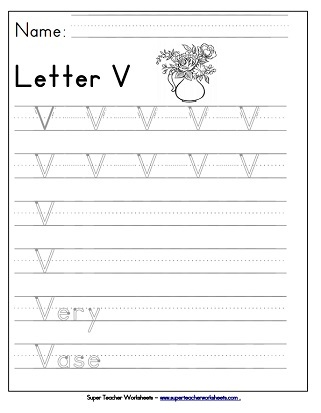 This is the perfect worksheet to practice writing capital letter V.
Print this worksheet for students to practice writing capital letter V.
After students practice writing upper-case and lower-case V, they can draw a picture of something that starts with V.
Practice letter recognition by dabbing the circles to form the shape of letter V.